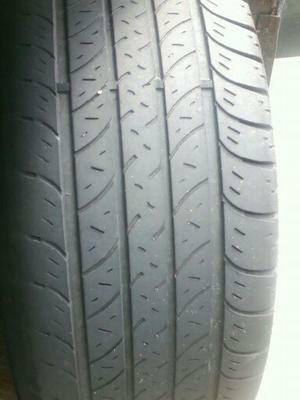 Well, four new Cooper CS4 Touring tires were installed on my 2002 Chevy sedan(around 147K miles on the vehicle) and 21 months later(there are 163xxx currently on vehicle) I have to research new tires again because there are less than one full tire rotation left in tread wear on these and the inside tread on all four tires is almost bald now. If I do the math I have gotten somewhere in the neighborhood of 17K miles on the vehilce since tires were installed. The 60 Series Cooper CS4 (H-Rated) tires are tagged with 60K warranty! I am a fairly conservative driver. I don't take chances with erratic driving because I have learned to give other driver's room to maneuver just in case. The tires handled in wet and dry conditions equally well and provided a comfortable, smooth ride. And generally it was a quiet ride. I feel the tires have demonstrated that they are well suited to provide a good ride except they lack the length of service I need in a passenger tire. I have for the most part had 30 or 40K miles in between tire replacements. I drive in various conditions including rain and snow ( I live in Wisconsin) and a combination of highway and city driving. The tires have not incurred any catastrophic failure, just the very limited service miles I have described. This tire is a classic case of indication the tire was on the front right or turned around on the left front and indices the auto needs a castor/camber realignment. That is why there is such heavy wear on one side versus the other. 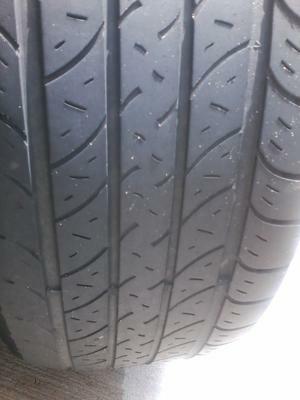 Upon inspection will find the top of your front tires are"leaned in" too far, and the fact you mention no howling noise, especially on corners backs my answer.